H2 Designs: The Paper Players Challenge #122 - Silver Anniversary! 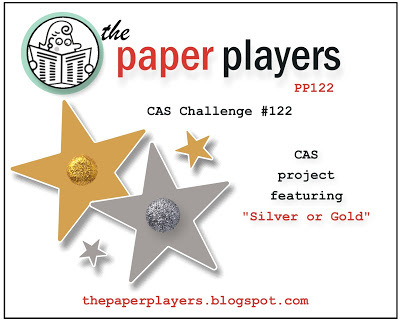 The Paper Players Challenge #122 - Silver Anniversary! Next I created & digitally die-cut the "25" & the mat, which forms the base of the card. The numerals were debossed with the Lacy Brocade embossing folder. The "wonderful" has been silver embossed on a vellum banner, which has a pierced border. To help the word stand out a little more, but still allow the numbers to show through, I layered extra vellum underneath the inner section of the banner. All the vellum layers have been attached with glue dots (hidden under the rhinestones). We hope you can join us this week at The Paper Players!